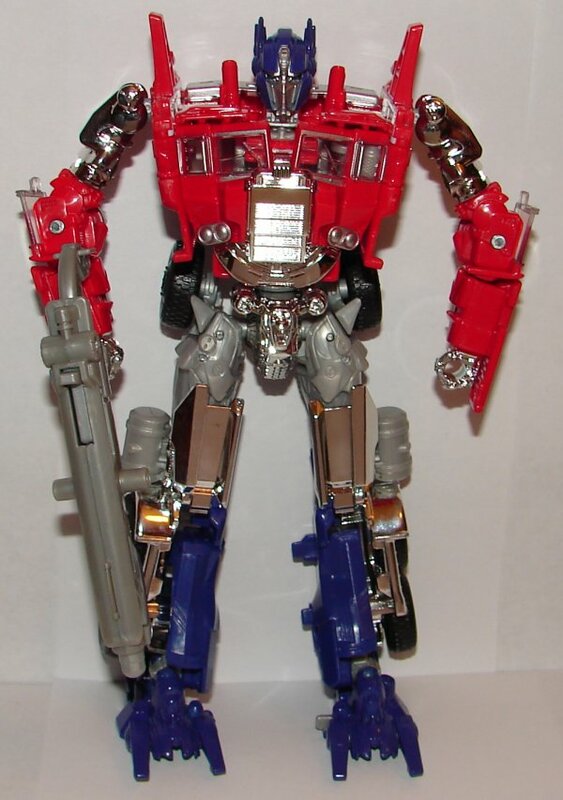 Read my reviews of the original Voyager Optimus Prime and Grimlock toys. Optimus Prime has the faceplate head sculpt that some of this toy’s repaints are getting here and in Japan, and it looks great. 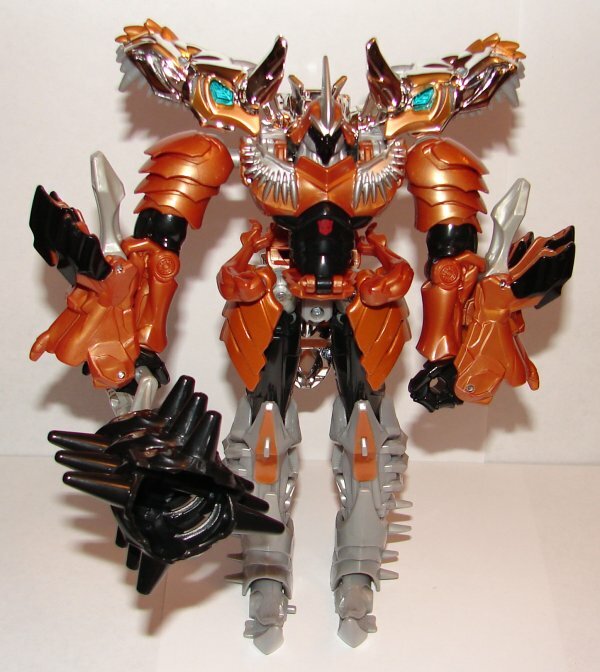 In robot mode he has chromed his fists, upper arms, grill, front bumper, knees, and rear fenders. Oddly, they did not chrome his fuel tanks where it would have made the most sense. In vehicle mode his grill and front bumper are not chromed. 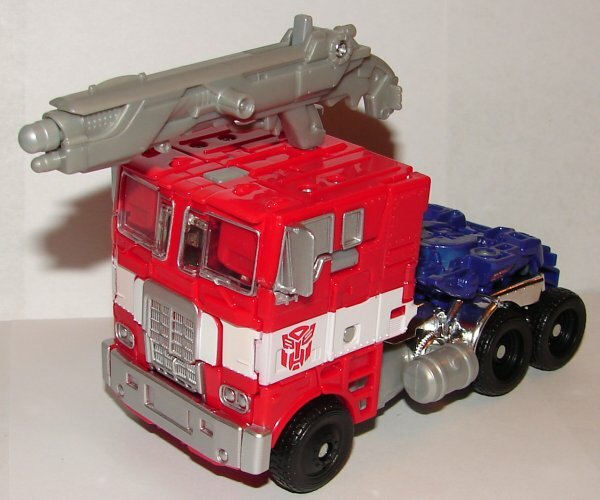 In recent years a lot of Optimus Prime toys have had a fake grill you see in robot mode as opposed to the one that you see on the truck. It’s a bit odd that his grill is chromed in robot mode but not in vehicle mode. They are painted silver, but I would have liked to see chrome there. For some reason they used white instead of silver for the stripe around the front and sides of the cab. It looks okay, but the silver would have looked better (and chrome even better than that). They probably did this to differentiate this from the other versions of the toy, but they should have left well enough alone. 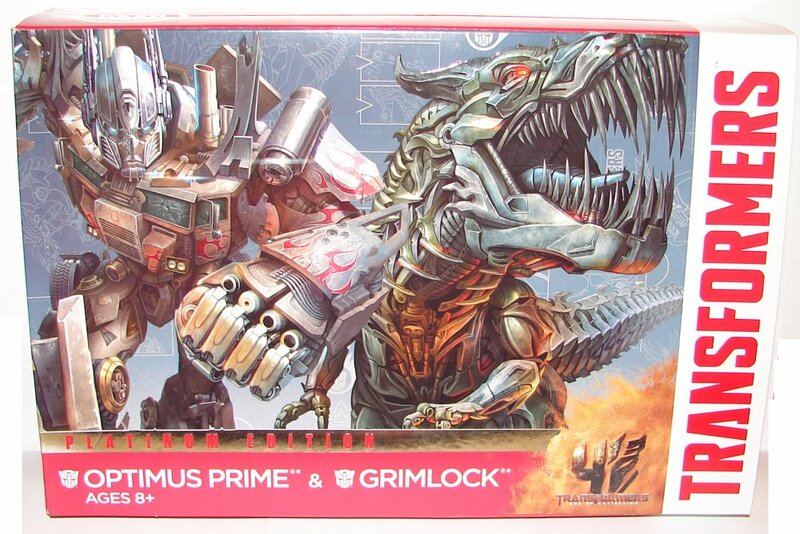 Grimlock has no mold changes and is basically the same as the regular release with a few exceptions. Chrome was added on his head, lower jaw, back of his neck, and on his back. He has a silver paint app on the outside of his dinosaur ankles. This version has a black face instead of silver, which I do not like at all. The silver face looks much better. Overall: This is not a bad looking set. I love the Chrome on Optimus Prime and new head sculpt. 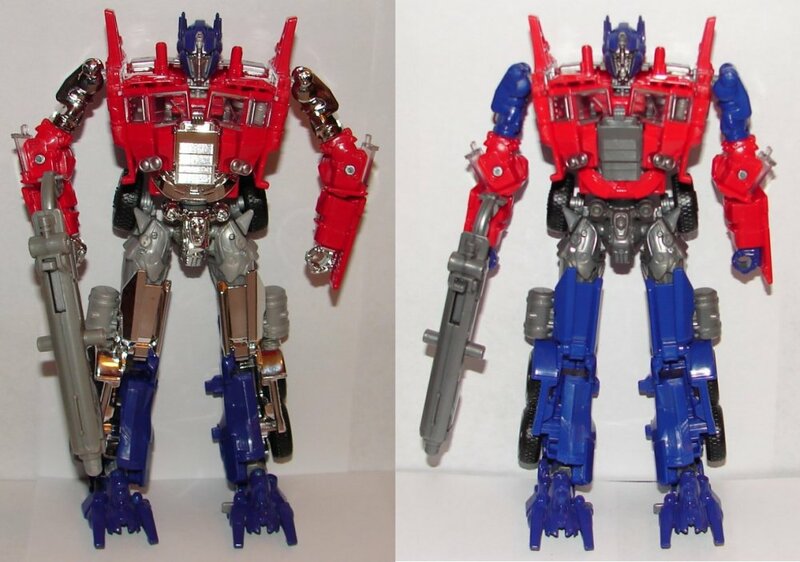 I’m not sure how this Optimus Prime will differ from the one in the Toys R Us Evolution set which should be out soon. 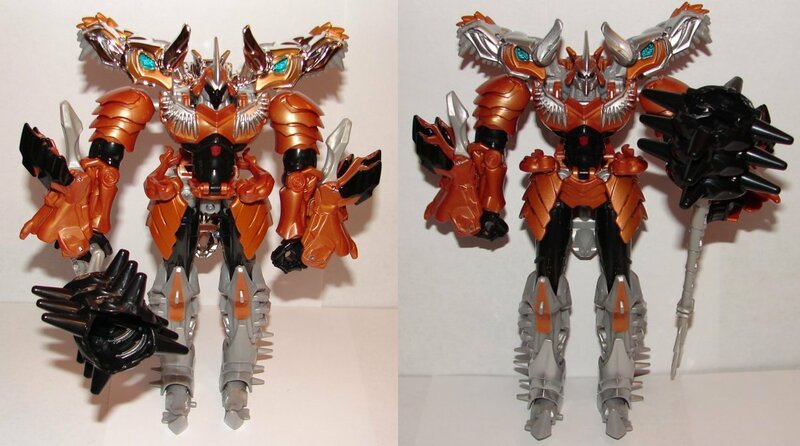 Grimlock is okay, but it seems like Hasbro did not Chrome the regular one just so they could chrome it in the 2-Pack. 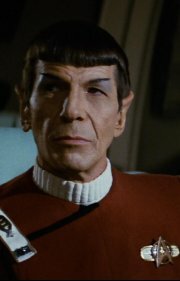 The real problem with this set is the cost. At $60 it is $10 more than two Voyagers at most stores. Back in 2009 stores had piles of unsold multipacks like this that had been priced more than the retail of the toys in the set. When for 2010 and DotM, the box sets were more moderately priced, at or a little less than the individual toys would have been. You would think they would learn from this, but apparently not. Also, I’m a little annoyed at Hasbro’s willingness to throw the “Platinum Edition” name on things. 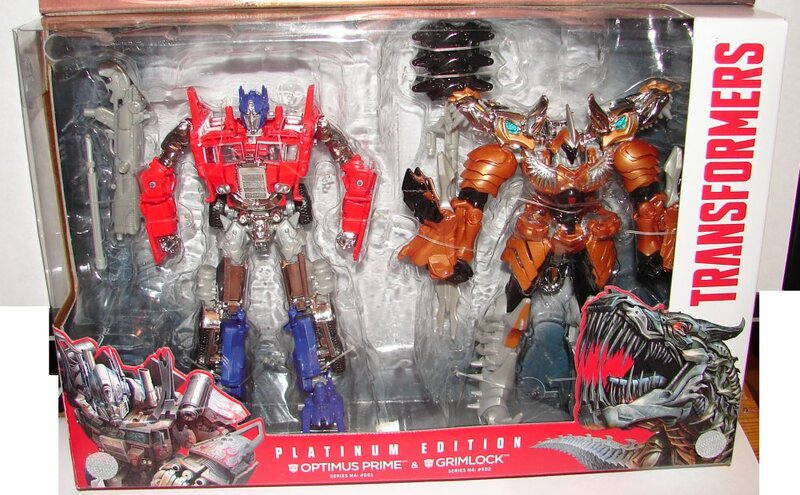 Some of the early Platinum Edition Toys were something special, older molds in super fancy boxes with completely new paint jobs. Now it’s just an excuse to bump up a price on a toy. 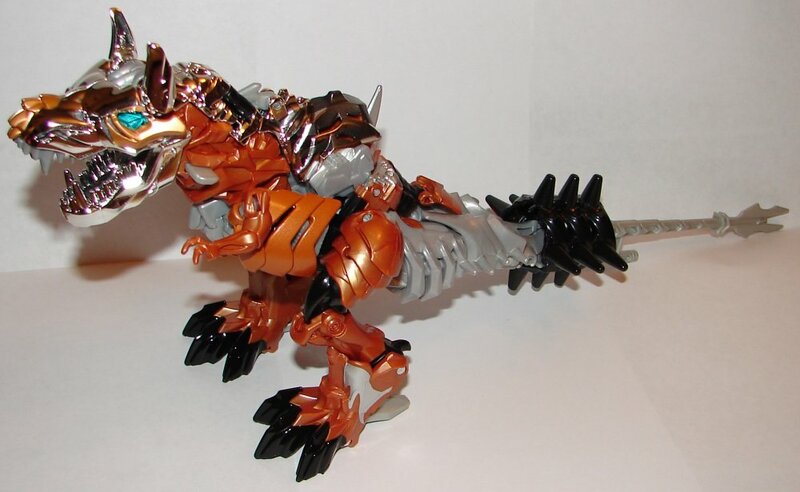 This entry was posted in Toy Reviews, Toys, Transformers and tagged Age of Extinction, AOE, Grimlock, Optimus Prime, Platinum, Platinum Edition, Toys, Transformers, Transformers: Age of Extinction, Voyager, Voyager Grimlock, Voyager Optimus Prime. Bookmark the permalink.